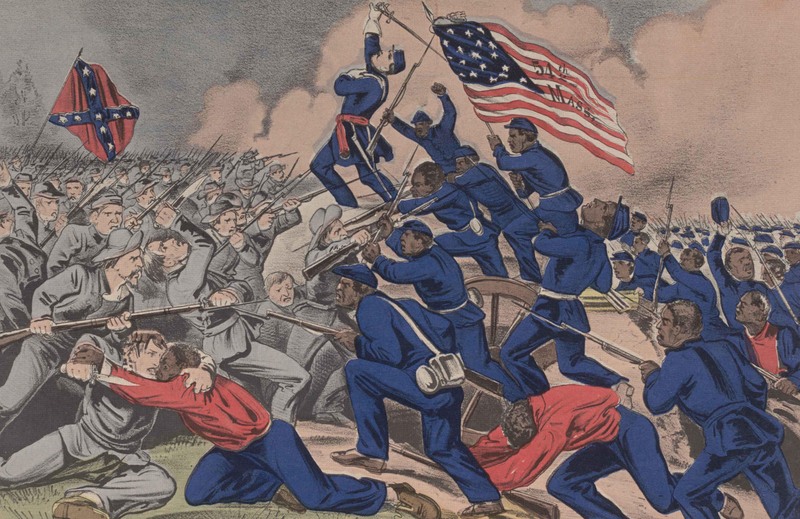 On July 18, 1863, on Morris Island near Charleston, South Carolina, the 54th Massachusetts Volunteer Infantry, a Union regiment of free African American men, began their assault on Fort Wagner, a Confederate stronghold. After the Civil War, a sergeant of the 54th, William Harvey Carney, became the first African American to be awarded the Congressional Medal of Honor for taking up the fallen Union flag and carrying it to the fort’s walls. Colonel Robert Gould Shaw, the commander of the regiment, was killed in the charge, along with 116 of his men, and the Union forces failed to capture the fort. Shaw, an abolitionist born to a prominent Boston family, had been recruited by Massachusetts governor John Andrew to raise and command the all-black regiment, the first regiment of African Americans recruited in the North. Shortly after the battle, the printing firm of Currier and Ives commemorated the 54th’s charge, portraying black soldiers carrying the Union flag over the fort’s ramparts and into the Confederate phalanx. The Gilder Lehrman Collection has one of the few surviving copies of this print.